It is perhaps inevitable that mistakes creep in to beading books as there are so many diagrams to check and double check. One error (see below) in a diagram flagged up when my Knotting and Braiding Bible was translated into French recently but over the Festive season I got a lovely message from a lady in the US telling me that she had found errors on two diagrams in the spin-off: The Beginner’s Guide to Kumihimo is available as an e-book and a physical copy. I tried out the two patterns for 16 strand kumihimo last night and thought she was right initially but I felt that I wasn’t concentrating (watching TV at the time!) so I started again and was relieved to find that the diagrams are both correct! This is the error on page 34 (p118 in the original paperback) – the instructions are correct but diagram 3 should look as the dark lines shown. It seems such a long time since I made this pretty necklace for I-Beads to feature in this month’s issue of Perlen Poesie but it has just been published. Inspired by I-Beads Celestial Skies Competition I chose beautiful dark blue seed beads to create the stars in Right Angle Weave that surround the bezelled Swarovski Rivolis. I also amended the star design slightly so that you can make a pair of earrings to match. The magazine is published in English as well as German and is available on subscription from the Perlen Poesie website. Every year I make some decorations for my tree and this year I’m making a few of these seed bead and pearl decorations to match my current colour scheme. These designs are from my book Simply Sparkling Christmas Beading and are very easy to make. The delica spiral is worked on a bead loom using 0.4mm wire instead of warp threads with 0.2mm wire to weave across. The pearl spiral uses a thicker 0.7mm wire with bell cone findings to hide the ends. These new crystals from Swarovski seem to be a bit like marmite – you either love them or hate them. I personally love the shape of the crystals and find them very inspiring to work with. 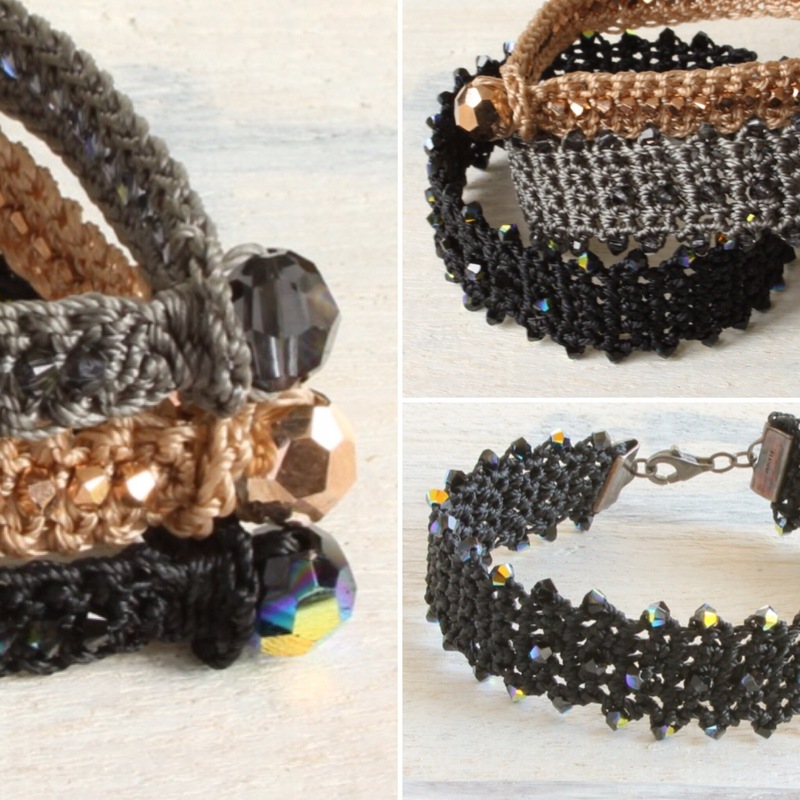 The macramé designs were commissioned by Swarovski to showcase innovative ways to attach the crystals. On the cuff bracelet and earrings, the macramé is completed before the crystals are stitched in place; the crystals are added into the pendant design as you go. First time nerves showing here! 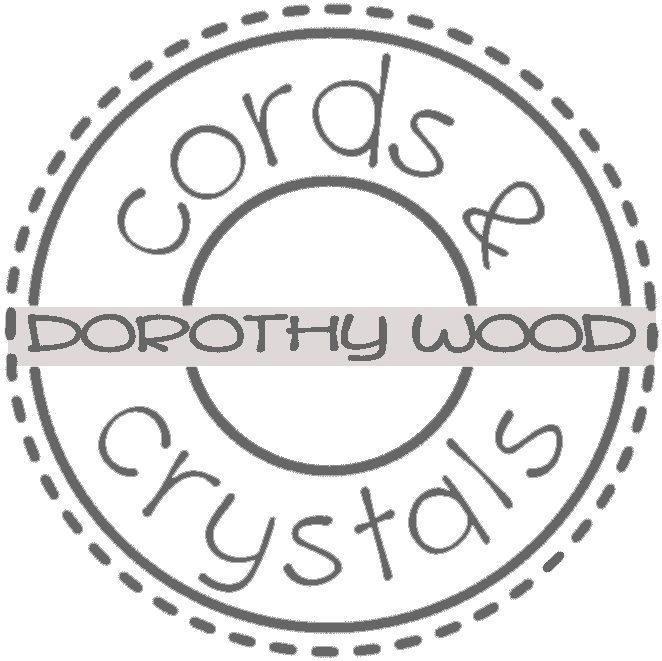 I’ve managed to get this far in my career without selling anything but this year having designed a range of crochet jewellery featuring Swarovski crystals and opened an ETSY shop, decided it was time to have a go! 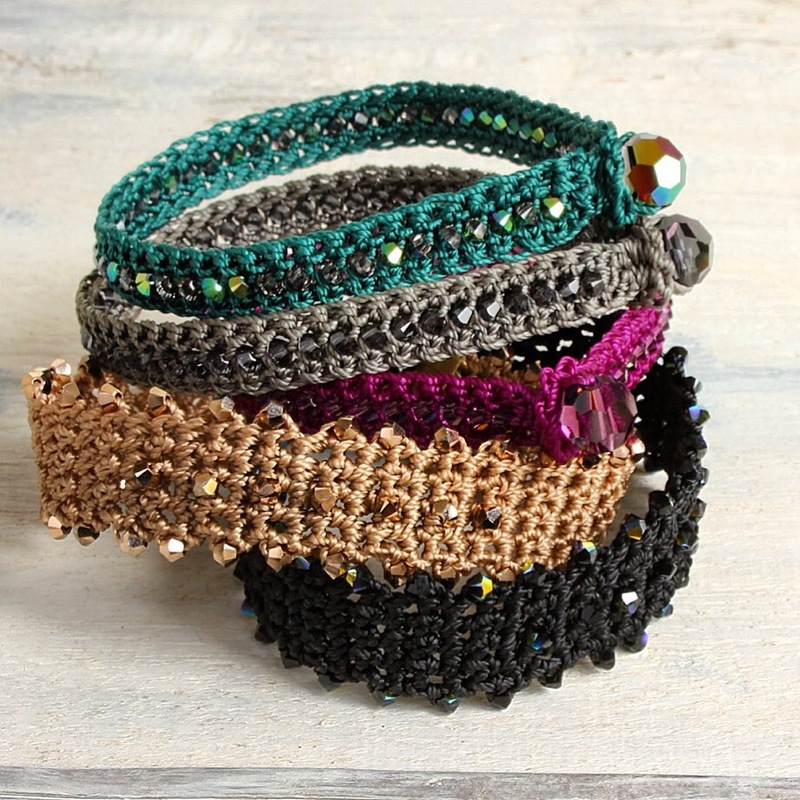 The designs are presently available in five cord colours with toning Swarovski crystals. Rose gold, graphite and black proved to be the most popular colours – perhaps neutrals are the safest bet for gifts? 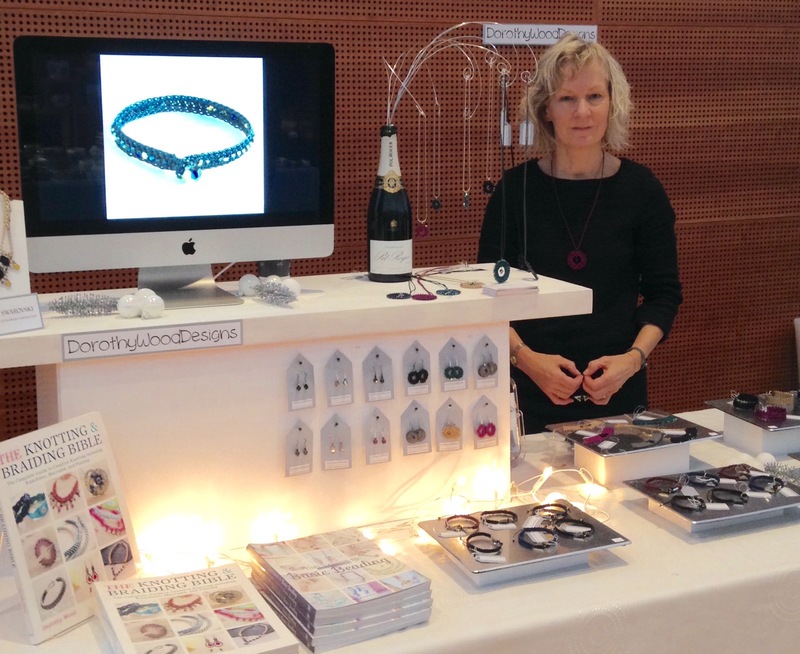 I’d love to hear what other people have found out about selling jewellery at craft shows and markets! The Knotting and Braiding Bible first published in 2014 has just been published in German, following on from the French edition ‘La Bible des Bijoux noués et tressés’ published last year. Buy the UK edition here, the French edition here or the German edition here. Armbänder knüpfen macht nicht nur Kindern und Jugendlichen Spaß. Obwohl die Zeiten der Makramee-Ampeln längst vorbei sind, können sich geknotete Bänder immer noch sehen lassen. Die Knotenbibel ist tatsächlich eine „Bibel“ für Menschen, die sich gerne Schmuckstücke oder nützliche Dinge knoten, knüpfen bzw. flechten wollen. Denn hier gibt es einen großen Fundus an Techniken und deren Anwendungsmöglichkeiten. Alle Anleitungen sind bebildert, sodass man die einzelnen Arbeitsschritte gut nachvollziehen kann. Sehr nützlich finde ich das Kapitel „Abschlusstechniken“ in dem die wichtigsten Möglichkeiten von Abschlüssen erklärt werden. Neben den Techniken des Knotens, Knüpfens und Flechtens gibt es noch das Kapitel „Projekte“, wo konkrete Anleitungen mit Materialbedarf gezeigt werden. Bevor es aber losgeht, lohnt es sich die einleitenden Kapitel zu Ausstattung und Basistechniken zu lesen. Fazit: Ein sehr umfassendes Buch mit gut erläuterten Schrit-für-Schritt-Anleitungen. So macht es Spaß, die Techniken auszuprobieren und selbst kreativ zu werden.